Tabodwe is the eleventh month of the Myanmar calendar and this is the last period of cool season, in January and February. The month of Tabodwe is the harvest festival, all the products of the farm and garden go in to make ‘’htamane’’a concoction of glutinous rice, toasted sesame , peanuts, fried coconut shavings , flavoured with ginger mixed with ground nut oil. 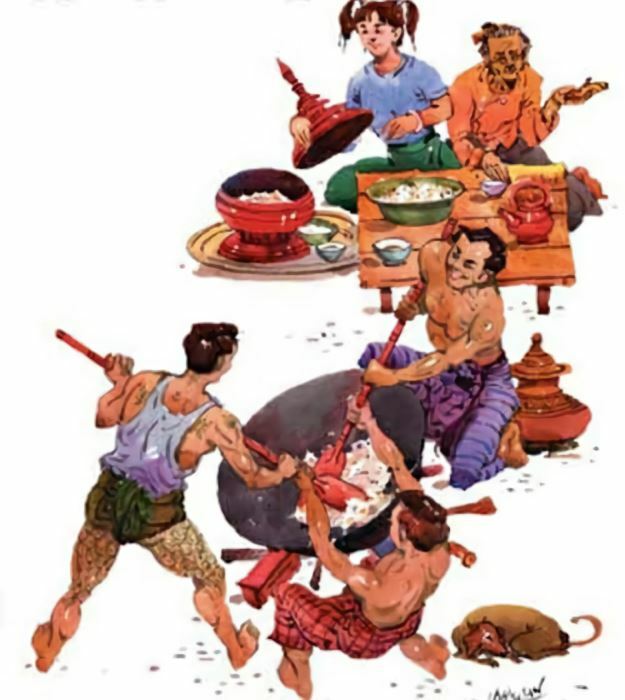 Htamane feast is either celebrated communally or done just in the private circle of family and friends. The nature of the feast is such that, in whatever way the feast is celebrated, it means a big gathering because many hands are needed. In a communal feast people come around with contributions of glutinous rice and other ingredients. It is an option though; one can just give his service, if not anything else. This year Saraniya Dhamma meditation centre will be holding the Htamane Pwe on the 17th of February and all are welcome.